Functionally Literate is our free reading series that pairs the best writers in Central Florida with visiting writers from all over the world, bringing contemporary literature to the city of Orlando. Past Functions have hosted a slew of talented visitors, including NY Times-bestselling authors Jeff VanderMeer and Lauren Groff; Irish poet Annemarie Ni Churreain; award-winning Portuguese novelist Jacinto Lucas Pires; the great Southern writer Padgett Powell; and the Director of the National Book Foundation, Lisa Lucas. Look for event details on our event page and join our e-mail newsletter to stay in the loop. Enjoy our events? We're even better on paper! 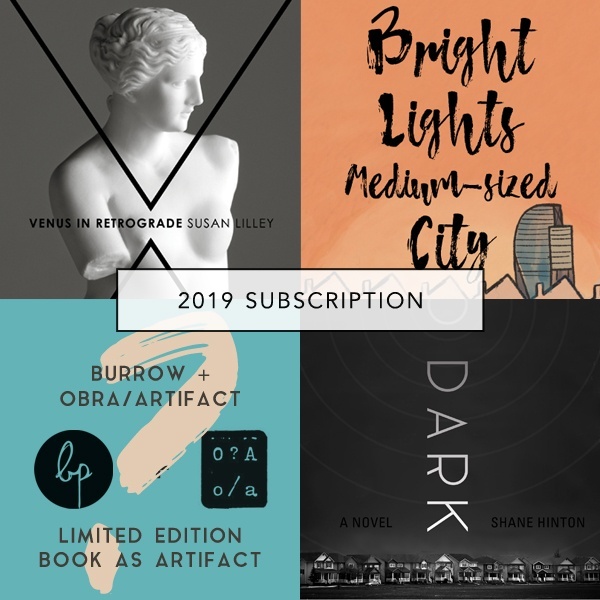 Burrow Press publishes four, carefully selected books each year, offered in an annual subscription package for a mere $60, which is about the cost of a nice dinner after attending a Functionally Literate event. Subscribers directly support our publishing program, putting more money into our authors' pockets and allowing us to take more artistic risks with what we publish. In return, you get the year's 4 books + ebooks + free shipping, name recognition in each book and on this site, and membership into our not-so-secret society: the illiterati, to whom we offer random and delightful perks throughout the year.